Some of the world's finest roads are made of water. Can you guess what they are called? A canal is straight and narrow, like some roads. But is filled with water, like a river. Canals are really water roads hat are dug by men to join together rivers or lakes or oceans so that boats can go from one to the other. On the canals the boats often have to be pulled along. 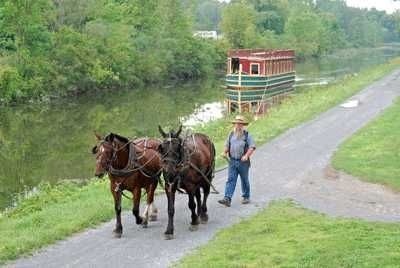 In olden days, horses or mules walking on a towpath beside a canal pulled the boats. 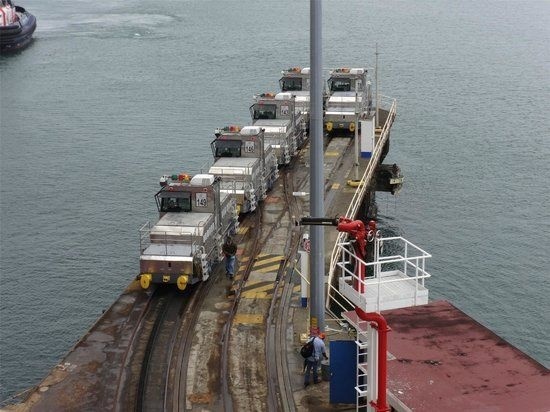 Today the boats are often pulled by electric locomotives. Sometimes the locomotives are called electric mules like the image below. Canals even go over hills and mountains. But you know that water can't flow up a hill - so how can the water and boats in a canal go up a hill? 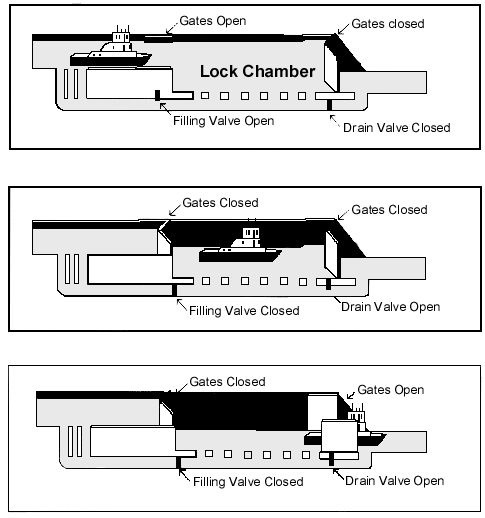 Something called a lock is used. Not the kind of lock you have on your door. A different kind of lock. I t is really a giant tank - a tank big enough to hold a whole long boat. The boat floats into the tank, and doors are closed behind it to lock it in there. Then more water is let into the tank. When the tank is full of water, the tank door in front of the boat is opened, and the boat floats out. The boat floats higher and higher as the water rises. It floats either out into a higher part of the canal or into another tank, or lock, which will lift it still higher. To go down the hill on the other side, the boat enters a lock that is full of water. As the water is let out of the lock, the boat floats lower and lower. Check the image below to understand how ships pass from tank to tank. Waterways - canals and navigations that are used for carrying vessels, transporting goods and even people. This video shows an example of a waterway located in USA. Aqueducts - this are water supply canals that used for the conveyance and delivery of drinking water for human consumption, used for municipal purposes, for hydro power canals and also for agriculture irrigation. Pont du Gard in Rome is considered to be the best ancient aqueduct in the world. Check the image below. Why Did They Build Canals? Anciently, canals were of great importance to the commerce, development, growth and vitality of a civilization. The transport capacity of pack animals is limited, the same thing for carts. Mules can carry an eighth-ton [250 pounds (113 kg)] maximum load on a journey measured in days and weeks, though much much more for shorter distances and periods with of course appropriate rest for the animals. Another thing, carts need roads. Transportation on water is much more efficient and cost-effective for larger cargoes. It goes back to the earliest days of history that has been recorded. Now, the existing canals are primarily used only for bulk cargo and large ship transportation industries but some still use it for irrigation just like how they used it in ancient days. 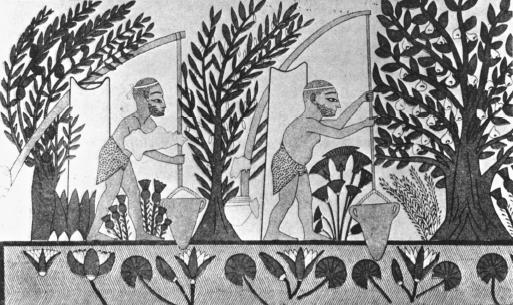 The image below shows the importance of canal in ancient Egypt, obviously for irrigation purposes. This one shows the modern use of canals by cargo ships of transportation industries. This 3D animation video shows the modern use of canals for irrigation. There is a city named Venice where many of the streets are canals. Houses and beautiful churches and hotels look as if they are floating in the water. In some places there is not even room at the sides of the canals for a towpath or a sidewalk - the water touches the sides of the houses. If you were in Venice and wanted to go somewhere, you might step out of your door into a boat. Some of the boats are gondolas - strange-looking boats, high at each end. A man stands at the back of the gondola and moves a long oar back and forth to make the gondola go like the image shown below. Amsterdam is a city that is much like Venice, with buildings on wooden piles. It became a city around 1300. Many Amsterdam canals were built as part of fortifications. They became grachten when the city was enlarged and houses were built alongside the water. The Panama Canal and the Suez Canal are just two of the world's busiest and most important canals ever built. They were considered two of the biggest construction projects of all time. 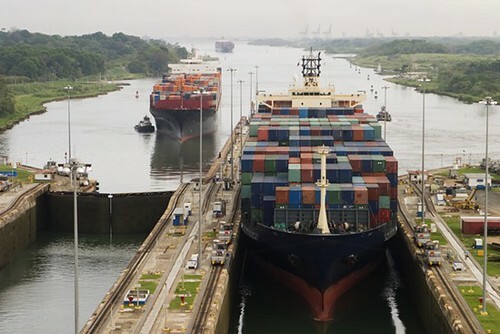 The Panama Canal is a 77.1-kilometer (48 mi) ship canal located obviously in Panama which connects the Atlantic Ocean (via the Caribbean Sea) to the Pacific Ocean. The Panama Canal was built to shorten the distance that ships have to travel to pass between the great Atlantic and Pacific Oceans. The canal benefits shippers of commercial goods, ranging from automobiles to grain, to save time and money by transporting cargo in a shorter span of time. 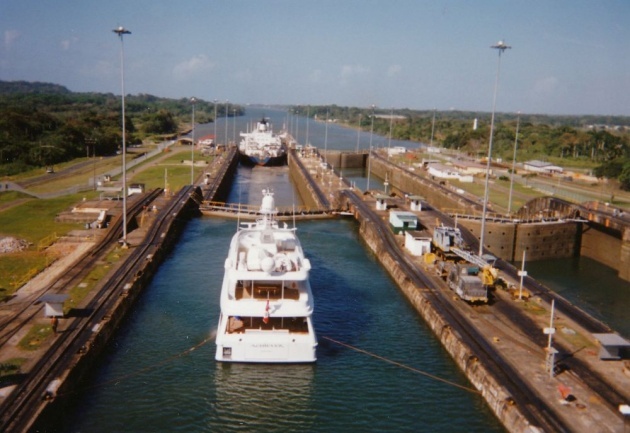 Watch a documentary video about Panama Canal to know more about it. The Suez Canal is actually an artificial sea-level waterway in Egypt. It connects the Mediterranean Sea to the Red Sea. Suez Canal is one of the most important waterways in the world. The Canal was opened in 1869 and it is approximately 163 kilometers long. It shortens the road between South Asia and Europe significantly. Just like Panama Canal, It helps people save time and money because of the shorter distance it requires them to travel. Below is a documentary video about Suez Canal, watch it to explore this amazing canal. As you've learned in this blog, canals is of great importance not only in ancient times but also in our time and in the generations to come. Who knows, in the future, people may find more ways to improve canals and also discover more benefits that canals give than we know today. Maybe you will be one of those people I'm talking about. Sounds funny? Yes, but it's possible. 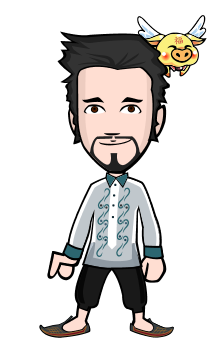 That's it, as usual this is rex_sensei concluding this blog. Cheers!